Step up to help Grays Harbor County respond! Mike Michener, at the scene of the DuPont train derailment in 2017. Michener is one of just a very few volunteers based in Grays Harbor County, where he hopes to recruit reinforcements from the local community. The pulse of the American Red Cross is largely determined by legions of volunteers making a difference in their communities and the lives of their neighbors. It is volunteers who comprise more than 95 percent of response teams nationwide, including here in the Northwest Region. And while many volunteers give freely for years and years, the churn of volunteers can lead a local chapter to find itself in need of more community members to step up and help insure adequate coverage. Such is the case in Grays Harbor County this spring, where the need for more volunteers to help serve cities and towns such as Aberdeen, Montesano, Ocean Shores, Westport, Hoquiam and Cosmopolis is great. A map of Grays Harbor County and the communities where volunteers are needed (left) within the Northwest Region (right). 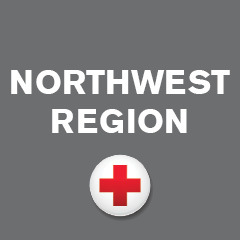 “We’d like to bring in eight to 10 more volunteers by the end of the year,” said Bonnie Bush, who oversees the South Sound Chapter of the Red Cross, which includes Grays Harbor County. Residents of the far-flung county willing to become Red Cross volunteers would provide immediate help to the local effort in Grays Harbor led by volunteer Mike Michener. “Any help we can get, we’d appreciate,” said Michener, whose widespread volunteer duties include serving as the Red Cross government liaison in Grays Harbor. It has fallen in recent months to Michener and another volunteer to respond to the majority of calls, which average about two dozen a year. When they’re not available, volunteers from surrounding counties are dispatched. Bush and Michener have made numerous outreach efforts to recruit more volunteers, bringing the need to the attention of local civic groups and through media outlets. While house fires comprise the majority of calls for help in Grays Harbor County, Michener said additional volunteers would be a great help to the ongoing Sound the Alarm Red Cross efforts to make certain every home has adequate smoke detectors. The Red Cross provides all the training and certification volunteers need for free. Including the opportunity for additional no-cost training in CPR and First Aid. For more information and to sign up to volunteer, visit redcross.org.